Then the woman asked Vargas, “Can you connect the … papers that your people can’t seem to get to the piece of paper my great, great, great grandmother was given? “And then she walked away!” Vargas recalled, with the pitch of his voice rising to a squeak of incredulity. The story, which Vargas shared with a crowd of journalists at the Education Writers Association’s recent higher education seminar in Atlanta, underscored his main points about how he believes reporters should write about undocumented immigrants and broader immigration topics. He made the case that immigration is a much more complex topic than is reflected in most news coverage and urged the audience to be more precise in their descriptions of undocumented immigrants, more careful with their words, and more nuanced with their reporting. Until that interaction in North Carolina, Vargas said, he had thought of the issue of immigration in the U.S. as a legal matter. “I thought I had read enough Martin Luther King (Jr.) to kind of question the idea of unjust laws,” Vargas said. But at the seminar, he tied immigration to issues of race, gender, and sexuality. Vargas worked for years as a journalist, with his byline appearing in major national publications such as The Washington Post, the New Yorker, and Rolling Stone. In 2011, he “came out” as undocumented in an essay published in The New York Times Magazine. Now, Vargas is founder and CEO of Define American, a nonprofit immigration advocacy organization, and EmergingUS, a media startup. At the seminar, Vargas talked of himself not only as an undocumented immigrant and activist, but also as a journalist, an entrepreneur, an employer. He joked that he came out of two closets – he is also gay – and that the “gay closet” was easier. For more than a decade, he kept his legal status secret from friends and his employers, including those at The Washington Post. Some journalists who worked with Vargas reportedly felt duped by, and roped into, his efforts to hide legal status, according to articles from the Post. Some critics accuse Vargas of “staging provocation.” Others want him to push harder, to be more confrontational, as an activist. Vargas said he wants his organizations to be resources for journalists, helping connect them with immigrants and improve news coverage of immigration. There tends to be little discussion about the population of undocumented immigrants who are not Latino but from countries in Africa or Asia, he said. For example, Vargas noted, there are 1,000 Nigerian immigrants who participate in the Deferred Action for Childhood Arrivals program, or DACA, a federal policy that granted temporary protection from deportation and work permits for individuals brought to the U.S. illegally as children.. In 2012, President Barack Obama announced the executive order now known as DACA. In early September, the Trump administration announced plans to rescind that order, calling on Congress to pass a replacement within six months, when a phase-out of DACA will begin. That means about 800,000 DACA recipients could become eligible for deportation as early as March. DACA recipients – who receive protection from deportation through two-year, renewable terms – represent a small fraction of the estimated 11 million immigrants who are unauthorized. 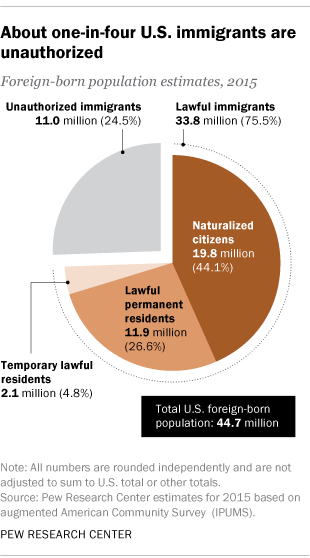 Overall, there are about 43 million immigrants in the United States, many of them living in mixed-status households. Immigrants – many of them Asian or Hispanic – will make up 88 percent of the nation’s total population growth over the next 50 years, according to the Pew Research Center. “In other words, a country that can barely talk about black people and Black Lives Matter without having a panic attack, a country that can’t even talk about Native Americans and include them in the conversation, is now going to have to deal with a country that is more Latino and more Asian,” Vargas said. This, Vargas said, is why discussions of immigration cannot be separated from issues of race. Vargas also urged journalists to challenge narratives from politicians such as Trump about undocumented immigrants’ economic contributions. Vargas advised reporters to give undocumented immigrants a choice about revealing their names for publication, noting many DACA recipients are adults and know the repercussions. He urged them to be more precise when describing an immigrant’s status, such as whether their green card expired or they were brought into the country as a child. He suggested reporters expand the number of immigrants they cite as sources in their coverage, not putting the burden of telling that story on one person. He didn’t, however, have suggestions about sources with views counter to his own who could speak in an informed way about immigration. Vargas also stressed the importance of language, questioning the common description of certain immigrants as “illegal,” including in prominent news outlets such as The New York Times. “Is there any other instance in the American vernacular where we refer to a group of people as illegal?” Vargas asked. He called on journalists to become better informed about immigration in general – to better inform the public through their reporting. Vargas predicted that when looking through the lens of history, the news industry will be embarrassed by its current coverage of immigration. He said he sometimes talks with hosts of popular television news shows before going on air, and is “stunned” by their questions.